In 1927, with some help from the famous Fred Waring, Kemp launched his professional career with a successful engagement at the Strand Roof in New York and a recording contract with Brunswick Records.The records were labelled as “Hal Kemp And His Orchestra” and the earlier ones often add “Formerly of The University of North Carolina”. Later, when “moonlighting” on disc for Okeh, Harmony, and Melotone, Kemp used the old Carolina Club Orchestra name, though who was fooled is open to question as the band’s distinctive sound comes over very clearly. On Banner the band became the Carolina Collegians and on Duphone, Hal’s Dixie Collegians.The emphasis on “Collegian”, plus the fact that amongst their recorded repertoire are quite a few college songs (“Sweetheart Of Sigma Chi”, “Washington And Lee Swing”, included here in a rare ton-vocal take, “Carolina” and “The Eyes Of Texas” also on this CD, and a double sided medley of “Southern College Songs”) tells us quite a lot about the image they were aiming to present, that of clean-cut, young, immaculately turned- out college boys, which is just what most of them were. The majority of the band’s recorded repertoire consisted, as one might expect, of current popular songs . Exceptions are “Brown Sugar” and “Go, Joe, Go”, two “hot “numbers in the “Peg Leg Stomp” mould, which they negotiate with ease and panache. There are so great soloists to be found prior to October, 1929, but the precision of the ensemble work and the lithe and springy rhythm section are always a pleasure to hear. The advent of Gene “Pinky” Kintzle’s crisp guitar and banjo work in October 1929 gives an extra fillip. The Hal Kemp Orchestra recorded little of jazz interest beyond the cut-off point of this CD. 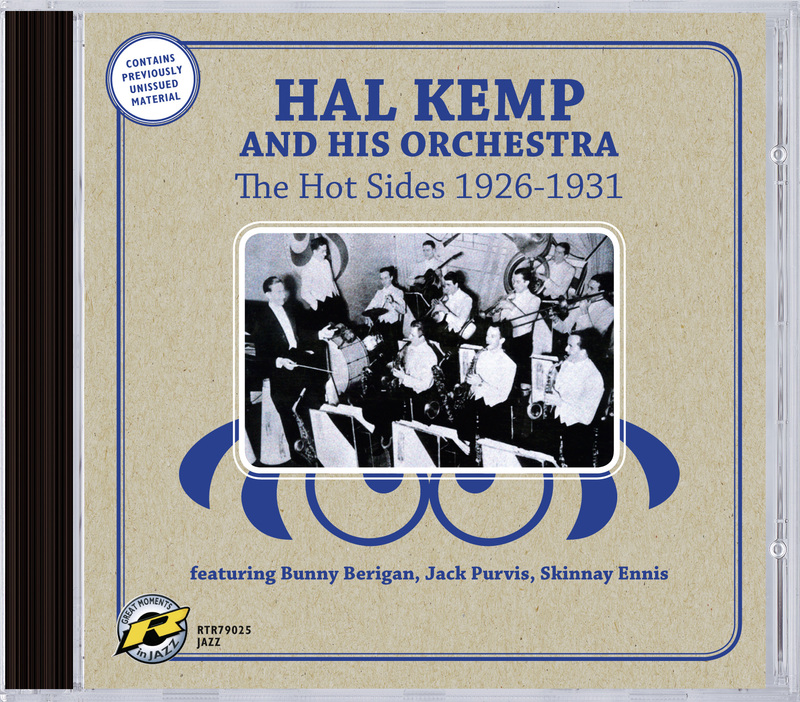 No-one could claim that Hal Kemp’s Orchestra played, or ever thought of playing, a major role in jazz history. They belong in the same category as the bands of Ben Bernie or Ted Weems - polished dance bands that could, and did sometimes, play hot music. But they deserve at least a footnote for introducing Bunny Berigan to recording and for giving a place to “Crazy Jack” Purvis. There is much good music to be enjoyed on this CD, certainly too good to be left gathering dust. It deserves to be heard. I say, is this CD out of print? Could you kindly indicate when it might become available again?